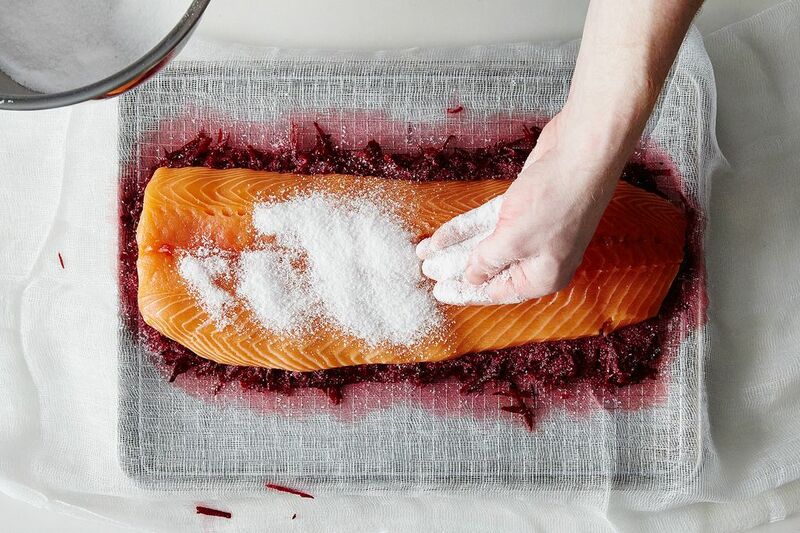 Today: Derek Laughren, Test Kitchen Manager here at Food52, shows us how adding beets to a salmon cure makes for a better lox. 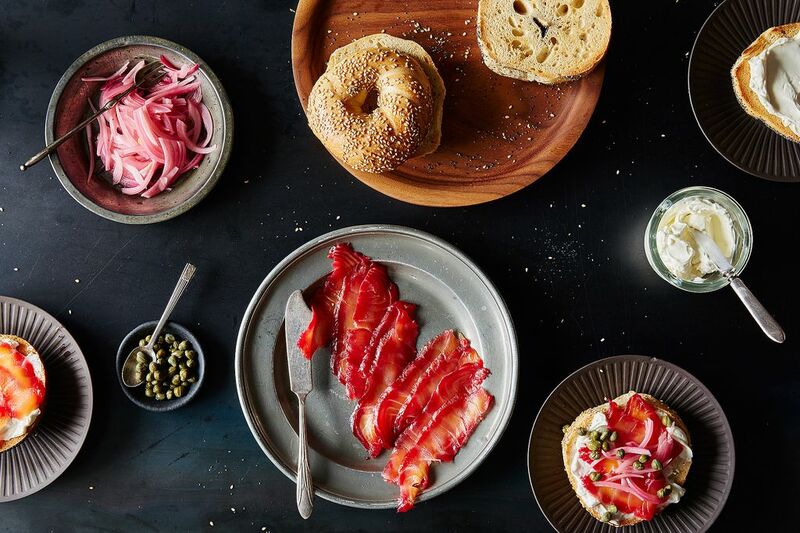 Buying a good cured salmon from a reputable grocer can be more than a little pricey, but I've watched my friends make the sacrfice time and time again in the name of a perfect bagel. I don't think I'm alone when I say, nothing goes better with a pumpernickel bagel and pickled onions than slices of sweet, salty salmon. Fortunately, the home version of salmon lox takes about as much time active preparation time as it does to walk to your local bagel shop—and much less money. More: While you're at it, make your bagels at home, too. 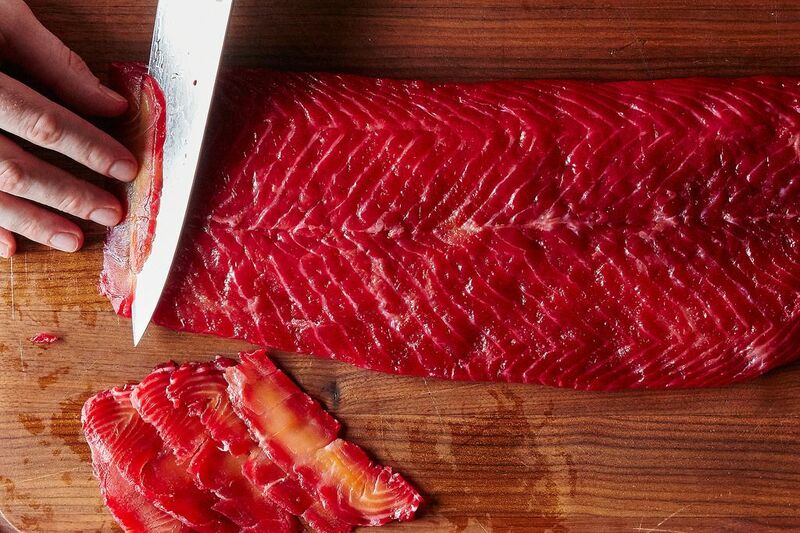 With only 4 ingredients, about 20 minutes of prep time, and a day and a half of setting it and forgetting it, you can make a visually stunning cured salmon that's sure to impress family and friends (not to mention yourself). This process leaves a brilliant red ring around the exterior of the fillet while dying the interior a vibrant pink. Either lay the vivid slices over toast or coil them into ruby-tinged rosettes. Enjoy them with a simple chived crème fraîche and capers, or lay them on thick over your morning bagel. However you choose to devour the salmon, save the recipe. This stuff goes fast. Start by cleaning the salmon. Pull out any pin bones using tweezers or needle-nosed pliers and remove any tough cartilage left over from the fins and belly flap. 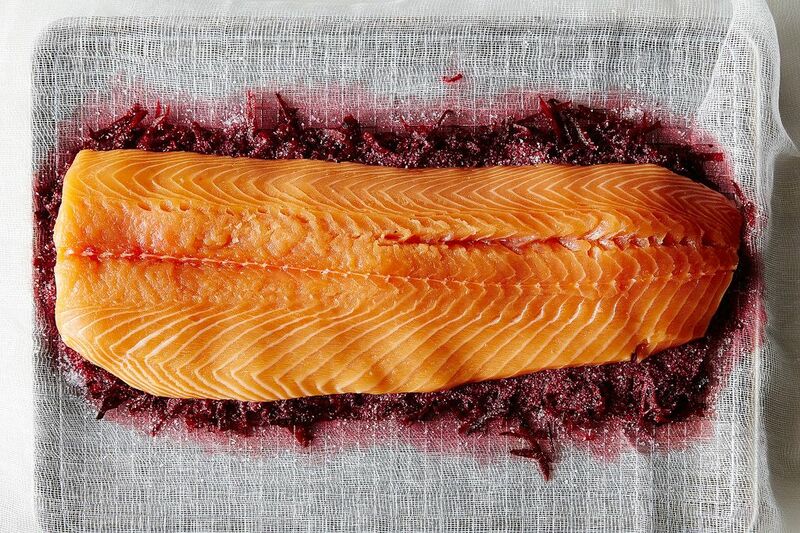 Carefully cut away any white flesh on the surface of the salmon and skin it by placing it skin-side down and placing your hand on top while you run the knfe along the skin (as shown in the photo above). Set the salmon aside. Get the rest of your items ready: Cut a piece of cheesecloth large enough to wrap the salmon a couple of times around and mix your sugar and salt in a medium bowl. Set both aside. 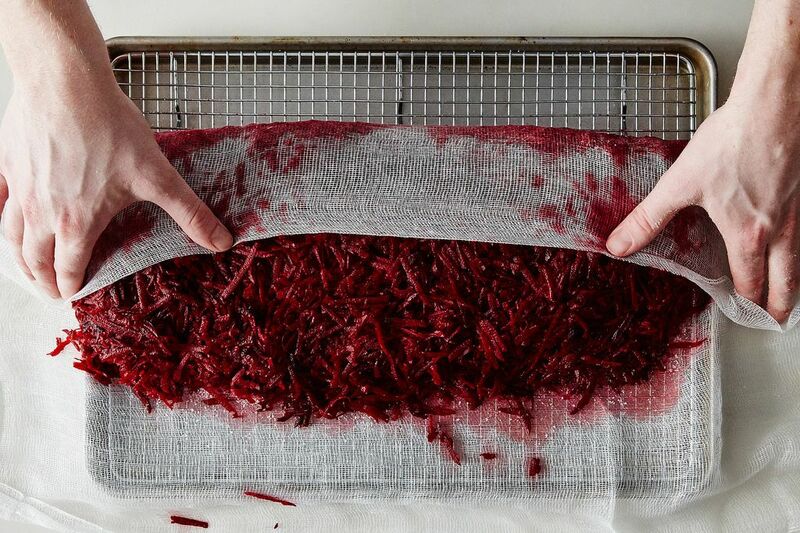 To prepare the beets, cut off the tops and bottoms, then peel them. 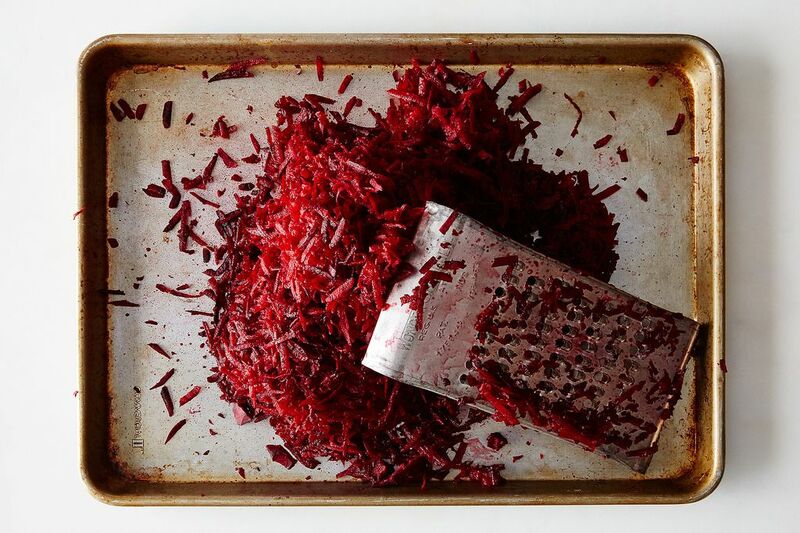 Using a medium cheese grater, grate the beets. To avoid staining your counters, it's best to do this over a sheet tray, newspapers, a flattened cardboard box, or whatever you have handy. Wear gloves to avoid being caught red-handed. Wring or press the beets to remove as much excess juice as possible. 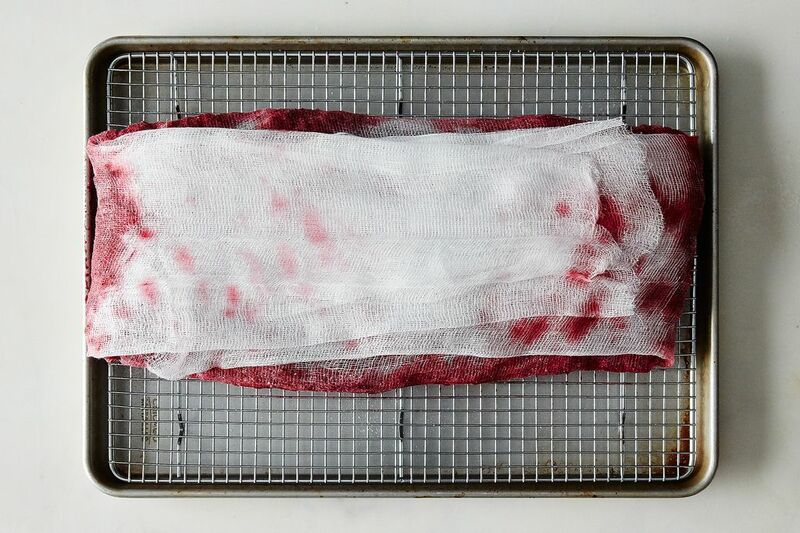 Lay out the prepared cheesecloth over a metal cooling rack placed over a sheet tray. 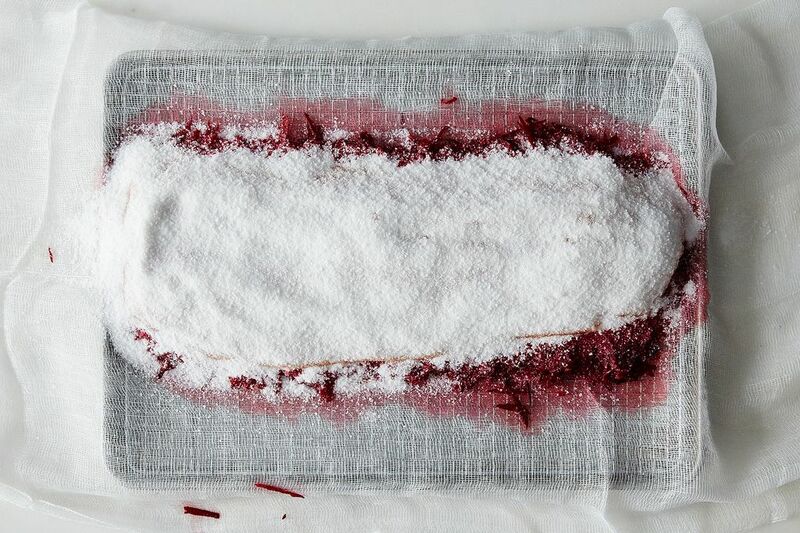 Place about half of the grated beets in the center, in the shape of the salmon. Lay about half of the sugar and salt on top of this. Finally, layer the salmon on top of this. Push any excess salt, sugar, and beets up against the sides of the salmon to make sure the whole bottom and sides of the salmon are covered. Press the remaining sugar and salt onto the surface of the salmon. 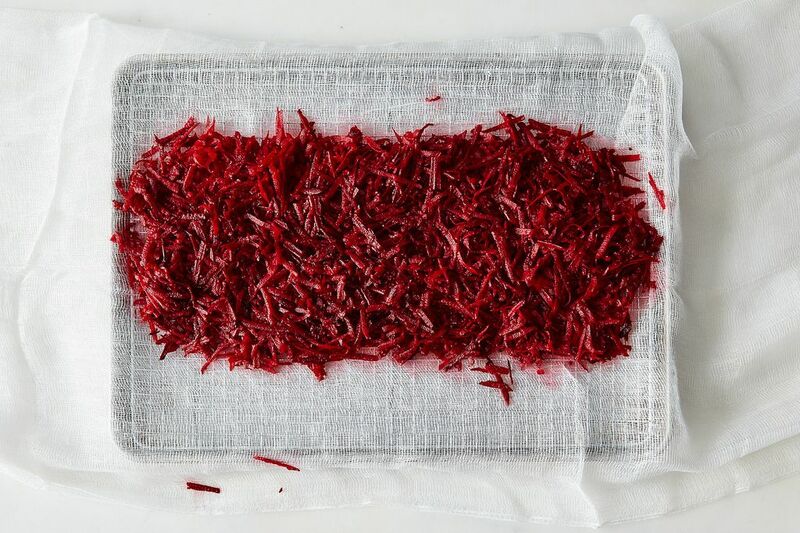 Lay the remaining shredded beets over the top (as shown below). The salmon will need two to three days to cure. Check it daily, draining any fluid that accumulates in the pan. When you're ready to unveil it, two to three days later, cut a small test portion from the tail end to ensure that you have a nice ruby ring around the outside of the salmon and that the flesh tastes salty enough for you. 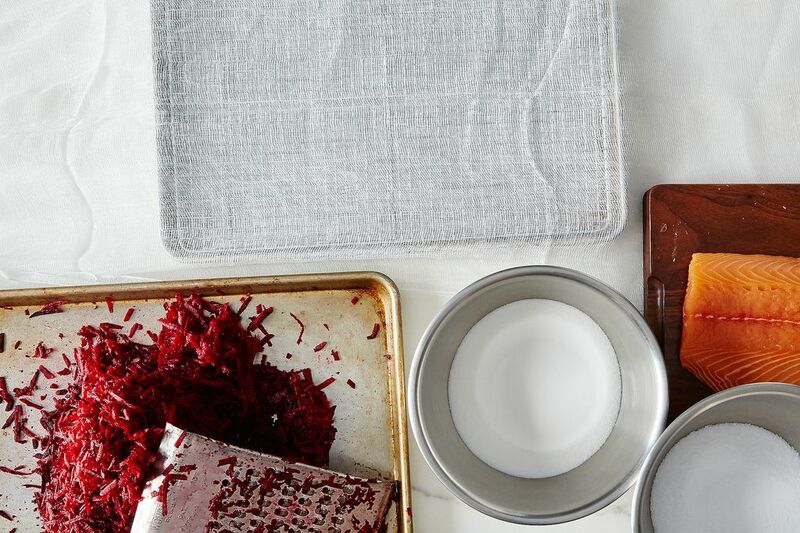 When you're happy, gently scrape away the beets, salt, and sugar with your hands or the back of a knife. You can rinse the whole thing gently under cold water, or you can wipe it down with a wet towel. 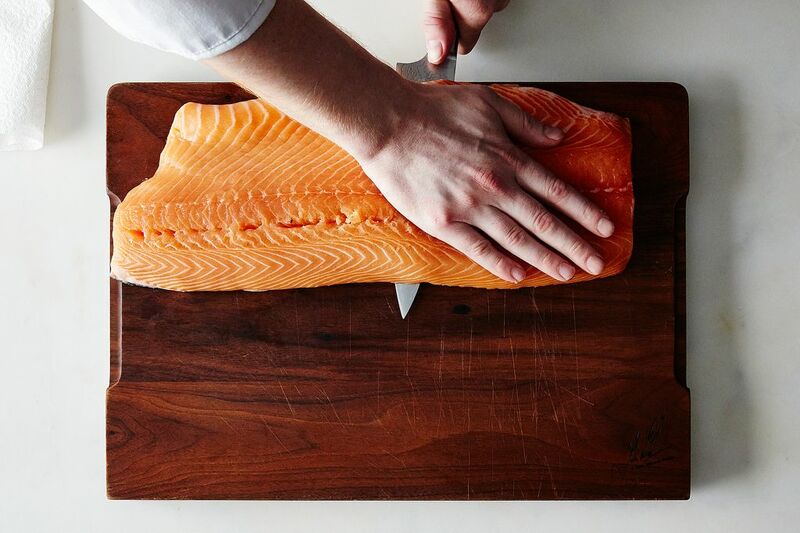 Don't leave the salmon in the cure too long, or it will be too salty, and, eventually, tough. When you serve it, shave thin slices (roughly 1/8 to 1/4 of an inch) off of the salmon and plate it. For a boosted presentation, curl the slices up into rosettes or waves to give the red edges a rippling effect—not that they'll need any dressing up. I made the recipe yesterday but can't tell from the instructions whether I'm supposed to tightly wrap the salmon in Saran Wrap, or just cover the whole baking tray with it? I chose the latter since you said to check after a day for liquid in the tray. Does anyone know which way to go? I cure salmon all the time using just salt and sugar. Recently I have gotten into adding herbs or chives or seasonings (one at a time). Looks like I will be trying it with beets as well. I usually let my salmon cure for 3 days. Going to make a 3 kg recipe for an event . Please do not fail me. I have tried Jamie Oliver recipe and was successful but not to my taste, too sweet. Your recipe looks more in proportion and simpler. So have decided to try it. Beets? ?never heard of it, I mean love beets but with cured salmon. In the top of the article it says a day and a half of waiting, but within the recipe it says two to three days. Which is closer? I need to make sure I plan ahead since this is for an event. Thanks! It could be as little as a day and a half, but more likely two. I would just plan to make it three days out and take it off cure as soon as it's ready. It'll hold just fine in your fridge until the event once it's rinsed, dried, and tightly wrapped. I make a stash of graavlox about once a month. I am curious as to what, exactly, the beets would add to the equation besides color (?) I use a flavorful cure/rub of salt, brown sugar, crushed fennel & coriander seeds, black, white & red peppercorns and dill and fennel fronds. What would the beets contribute? Just wondering before I embark upon this hand and kitchen-staining experiment. It adds an earthy, mineral sweetness to the dish that pairs well with the salty minerality of the seafood and the high sugar content of the cure. The color is a big part of it, though. This recipie sounds great, I make gravlox a lot but have never tried it with beets. Will try it next time I make lox. We live on Saltspring Island BC so have access to great salmon . How long will this keep fresh in the fridge or freezer? In the fridge, at least a week and up to three. In the freezer, at least a couple months and up to 4.
ok, This looks Amazing ... I cant wait to try this - I'm officially stoked!!!! This is awesome! I have been wanting to experiment with this since having it at black seed. So good.